Do you have a Facebook account and want to link it to your website? It is not a problem. All you need to do is download from Facebook a piece of code and place it in website builder WebWave in HTML element. When you do that, website users will be able to like your Facebook page and to share it with their friends. In this article, you will learn how to build a website and integrate it with Facebook. Page Plugin allows users to like a certain profile created on Facebook directly from your website. In order to download Page Plugin code, go to https://developers.facebook.com/docs/plugins/page-plugin and enter parameters of your website. 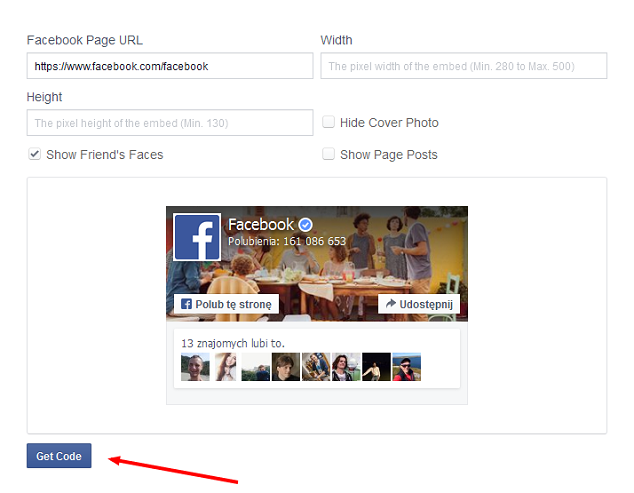 Remember to share an URL address of your fanpage on Facebook and set element's width and heigth. You can change other settings, but they can also be left default. Select "Get Code" and paste it to HTML element in website builder WebWave. Set the element's width and height to the same as in the previous step. "Like it!" button is the quickest way for users to share your website with their friends on Facebook. Even though "Like it!" button and Page Plugin might, in some cases, look exactly the same, the difference is that Page Plugin allows users to like a particular Facebook fan page, where "Like it" button allows users to like a certain website. To place a "Like it!" button on your website, go to https://developers.facebook.com/docs/plugins/like-button?locale=pl_PL, download code and paste it to HTML element in website builder WebWave. You can also use a WebWave element "Like it! ", which can be added through a toolbar on the left side of the builder. Facebook shares a couple of more social plugins, which can be placed on websites created in WebWave just like a Page Plugin - through "HTML, CSS, JS" element.